The 22 year-old Aberdeenshire student revealed there was never any question which university she would select after leaving Alford Academy. She said: “I chose Aberdeen University because it was close to home and my family. Ms Hicks added she was “so excited” to see her hard work come to fruition after finding out she had gained a first in her dissertation. Aside from her studies, Ms Hicks engaged in university life by joining both the horse riding and politics societies. But the hard work doesn’t stop here for the young student. 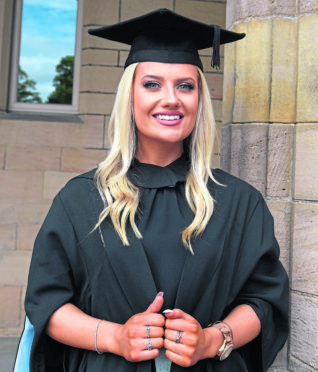 Miss Hicks has a short summer break before embarking on a masters degree in Russian, Eastern European and Eurasian Studies at Glasgow University. Once that has been completed, she is looking forward to breaking the stereotype surrounding politicians. She said: “I think people have an idea in their head of politics students. They think they want to go straight to Westminster, that they’re overly confident and such.